If your dog is simply too big for a bicycle pet carrier, and way to young and active for a pet trailer, then consider dog leashes for bike riding. Walking or running your pooch beside your bicycle while you ride. But if you have an active dog, this may not be a safe idea, especially if you are holding the leash as well as trying to control and do your signals for turns. With more and more people getting out on their bicycles, and leaving the car at home, the pets are getting involved in these family activities. What better way to burn off some of that pent up energy from your pet sitting home all day? Get out your bike and take him with your for a jog beside your bike. Maybe you jog and regularly take the dog with you, but tend to head out alone, well to keep things safe, there are these new attachments on the market that help your dog run beside you and yet you keep total control of your bike. These accessories are considered a safer way for biking with your pooch. They are usually called bike leashes for dogs or something similar. They quickly attach to your bicycle, but can just as quickly un-attach. You can use them as a regular leash or quickly attach it and head out for a ride with your Fido running beside you. This hands free leash stops your buddy from getting tangled up in the bike, but the most important part, is that it keeps you in control. Nothing worse than a cat suddenly darting by or a squirrel. If you are holding the leash in your hand, then it could pull you off the bike or worse, into traffic. So, for the small investment, this makes a great accessory for your bike. Leashes for bicycle riding have become very popular now, as no one wants to leave their best friend at home while they head to the park or the trails. Once suggestion though, if you do use these leashes while riding, is that you outfit your dog with a harness, rather than just attaching it to his collar. It makes for a more comfortable run for him and you. But once your dog has had a few runs using these leash accesories, you should not have problems with him trying to pull away. Just don't forget he is there while you are riding your bike! Carry a backpack with water in it, and take frequent water breaks for you and your dog. A dog can quickly become dehydrated on a run. 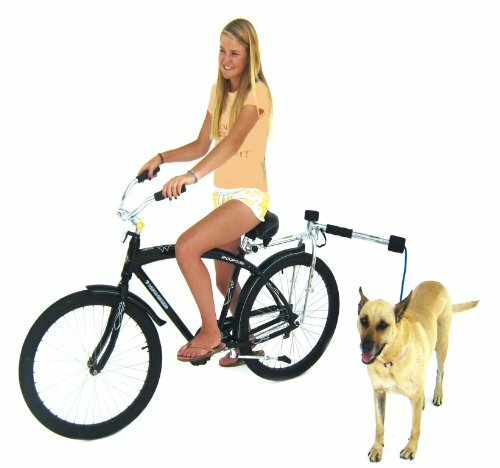 So, if you are looking to try some other exercises with your dog, then consider using a hands free bike leash, so that you have total control. If this is your first time out with this accessory. Make sure it is on properly and then try it out in your yard or quiet street to make sure your dog is OK with this idea. He may be scared at first, but if you give him treats and he realizes how fun it is, he will be fine. You can purchase these dog leashes for bike riding at pet supply stores, and bike accessory stores, but you can also get them online. Also see cute helmet covers for kids, to keep them safe, and small dog helmet to keep your tiny pooch safe. your pooch will love it.